The 2011 Champion Hurdle marked the first appearance at the Cheltenham Festival of the prolific Hurricane Fly, trained by Willie Mullins, who’d only be beaten once in eight Grade One starts since joining the Co. Carlow handler. Ridden by Ruby Walsh, Hurricane Fly travelled well into the race after the second last, but was ultimately all out to hold Peddlers Cross by 1¼ lengths with Oscar Whisky 5 lengths further behind in third. 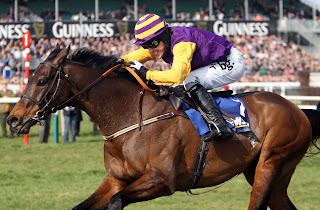 The 2011 Queen Mother Champion Chase featured the winners of the previous three renewals, Big Zeb (2010) and Master Minded (2008, 2009), with the latter sent off the 2/1 favourite to banish the memory of a lacklustre performance in the previous renewal. However, it was the 10/1 chance Sizing Europe, trained by Henry de Bromhead in Co. Waterford and ridden by Andrew Lynch, who landed the spoils, staying on strongly to beat Big Zeb by 5 lengths. Captain Cee Bee finished third, beaten a further 4 lengths, while Master Minded blundered badly at the second last fence and was eased down to finish eighth of the 11 finishers. Dual winner Big Buck’s was backed as if defeat was out of the question on his hat-trick attempt and, despite Ruby Walsh dropping his whip in the closing stages, stayed on stoutly to beat Grand Crus by 1¾ lengths and justify 10/11 favouritism. The victory took his winning tally to 11 races in a row, including five at Grade One level. For the record, Mourad stayed on, without threatening, to finish third, but a further 2¾ lengths. The 2011 Cheltenham Gold Cup was a vintage renewal, with three previous winners, Kauto Star, Denman and Imperial Commander, among the 13 runners. However, it was the King George VI Chase winner, Long Run, who started favourite at 7/2. Trained by Nicky Henderson and ridden by amateur jockey Sam Waley-Cohen, the 6-year-old made short work of Denman and Kauto Star, staying on strongly up the hill to win by 7 lengths and 4 lengths. Defending champion, and second favourite, Imperial Commander was tailed off when pulled up before the final fence and was found to have finished lame.